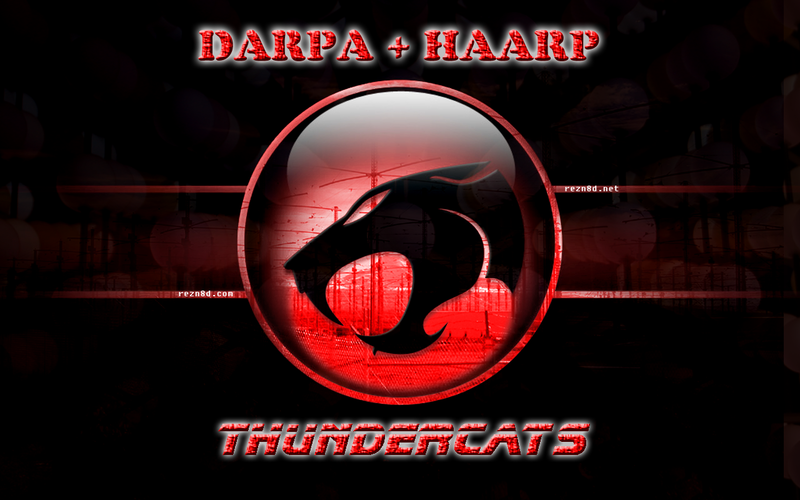 As previously discussed in my article, HAARP, Project NIMBUS, and the Fire of the Gods, DARPA is eagerly pursuing the capability of striking any target worldwide with “fire from the heavens”. 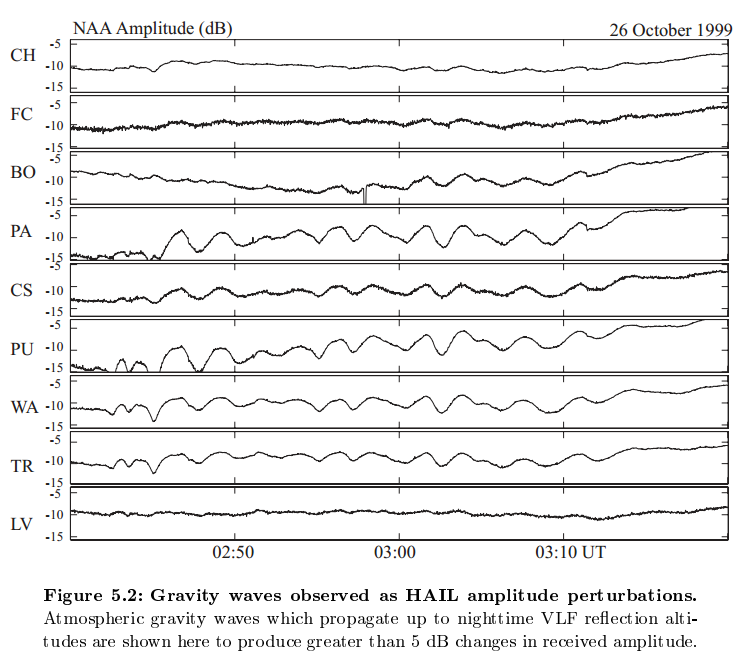 Conduct comprehensive HAARP-ULF experiments to study the onset of noise under a variety of space-weather conditions. Conduct a series of experiments to inject VLF waves into artificial ducts. 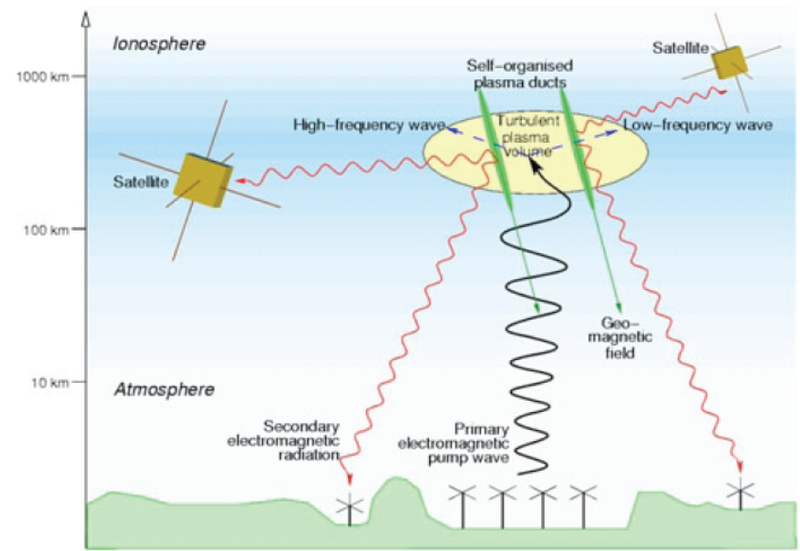 Develop, implement and test a continuously-operational, extensive array of instruments which will measure all atmospheric and electromagnetic components of tropospheric lightning and correlate this phenomenon with various ionospheric events. Deploy balloons into thunderstorms to make in-situ electric field, X-ray and gamma-ray measurements. Develop and deploy a constellation of receivers to study the radio emissions generated by lightning and associated ionospheric events. ELF/VLF stands for Extremely Low Frequency and Very Low Frequency, and refers to the range 300 Hz to 30 kHz. We’re talking about radio waves, like the AM/FM signals you get, just at an even lower frequency. 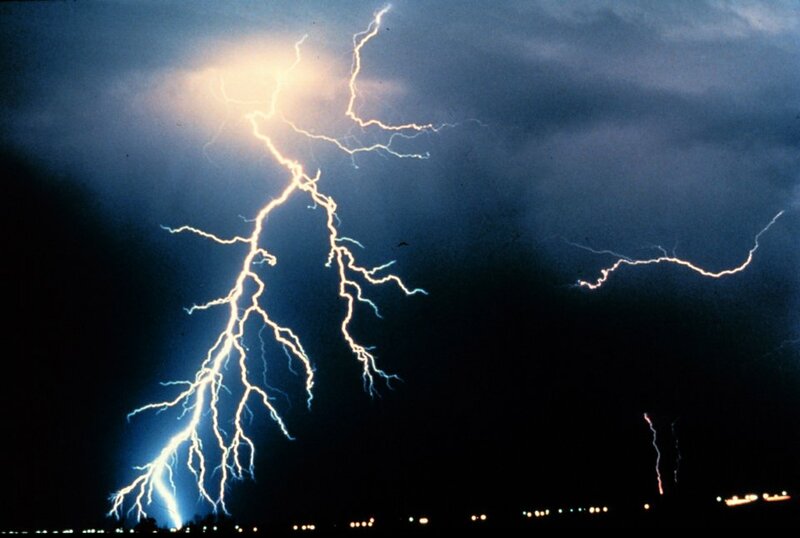 On our planet, the most potent source of ELF/VLF waves is lightning, so a lot of what we do comes down to studying lightning and its various impacts on our Earth’s environment, detectable even in Antarctica. Lightning has broader impacts than just the flash of light and thunder. For instance, certain kinds of lightning can cause a brief discharge tens of miles above the cloud, called sprites, which were predicted in the 1920s but not discovered by scientists until 1989. In fact, some lightning can even accelerate electrons to speeds enormously close the speed of light, producing gamma rays that we usually only see in association with collapsing stars and black holes. The Stanford ELF/VLF group is actively engaged in understanding how lightning impacts out planet’s ionosphere and magnetosphere. Read more about studies of sprites and transient luminous phenomena, and terrestrial gamma-ray flashes. Location: The United States is home to thunderstorms of various type, duration, scale and intensity. 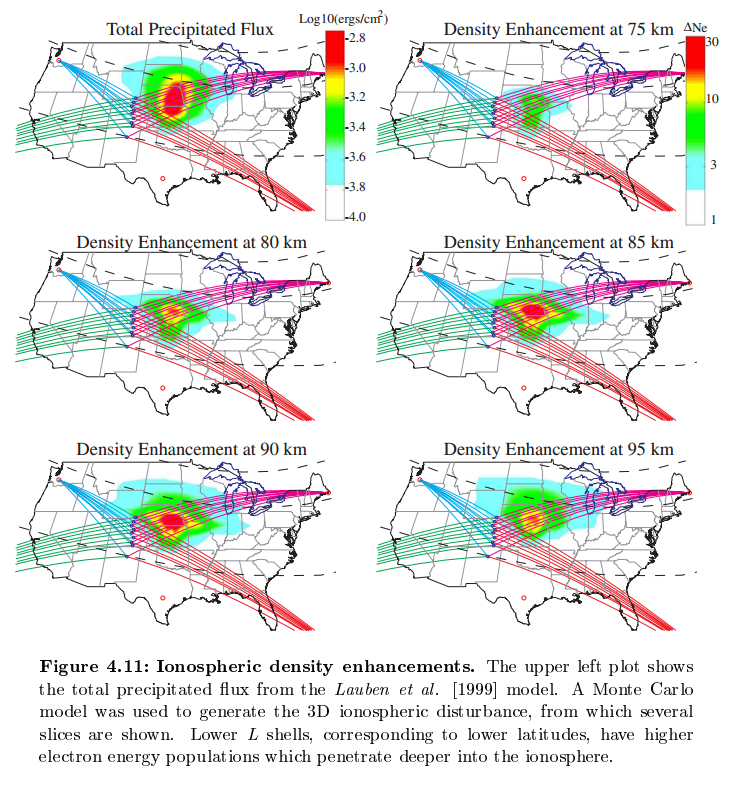 This program would like to capitalize on the unique geographic features of various locations across the CONUS that offer an increased likelihood of intercepting thunderstorms that exhibit unique characteristics (e.g., elevated, supercellular, multicellular, pulse, etc.). What’s a duct? A hole in the ionosphere made from a sounding rocket and HAARP. The rocket’s exhaust burns a hole in the ionosphere, starting a vortex (tornado) that HAARP and HIPAS regulate. 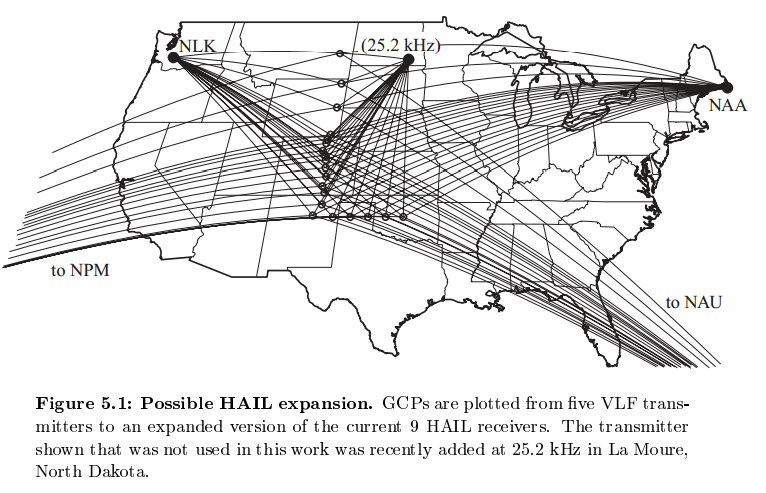 The lightning induced D-region disturbances studied with the HAIL array and photometric sensors affect VLF communications, particularly during periods of increased solar activity. Also, remote sensing of these disturbances is contributing to the understanding of D-region chemical and electrical processes. The National Weather Service office in Tulsa reports receiving several phone calls from residents who mistook a strong clap of thunder for an earthquake. Meteorologist Pete Snyder says he felt his south Tulsa home shake during the thunder Tuesday morning and that people from across the Tulsa metro area called the weather service to ask if it was an earthquake. 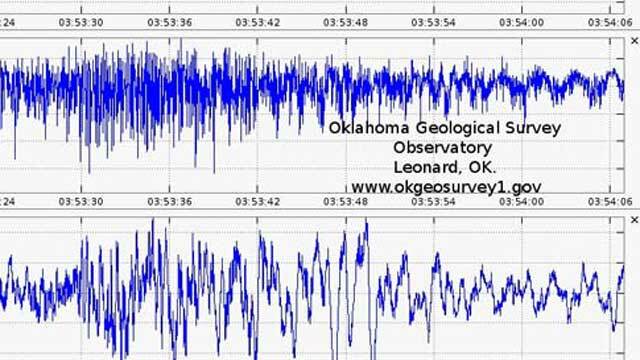 Research seismologist Austin Holland with the Oklahoma Geological Survey says thunder was recorded at seismic stations across the state during the night. Holland says there were no earthquakes recorded in the state either Monday night or Tuesday morning that would have been large enough to have been felt. The HAIL project centers around Tulsa, Oklahoma where the strike occurred, giving an ideal holographic view of their “induced” lightning. 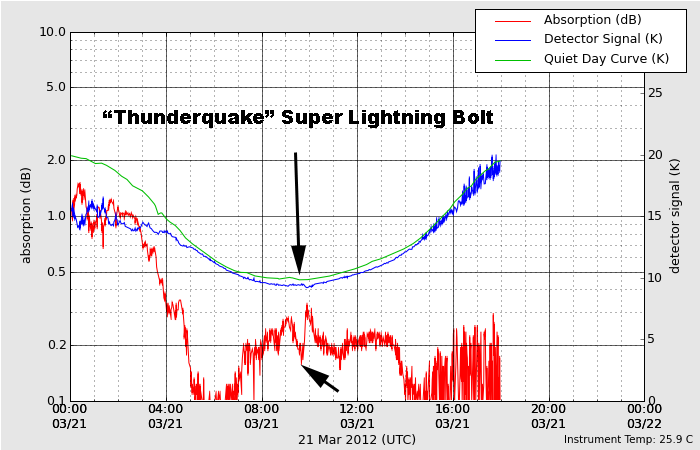 Was this “Thunderquake” man-made? You be the judge. 8+14+20 = 42 coincidence? Read this book. Carlson, B. E., N. G. Lehtinen, and U. S. Inan (2007), Constraints on terrestrial gamma ray flash production from satellite observation, Geophys. Res. Lett., 34, L08,809, doi: rm10.1029/2006GL029229. Carlson, B. E., N. G. Lehtinen, and U. S. Inan (2009), Terrestrial gamma ray flash production by lightning current pulses, J. Geophys. Res., 114(A13), A00E08, doi: rm10.1029/2009JA014531. Cohen, M. B., U. S. Inan, and G. Fishman (2006), Terrestrial gamma ray flashes observed aboard the Compton Gamma Ray Observatory/Burst and Transient Source Experiment and ELF/VLF radio atmospherics, J. Geophys. Res., 111, D24,109, doi: rm10.1029/2005JD006987. Cohen, M. B., U. S. Inan, R. K. Said, and T. Gjesteland (2010), Geolocation of terrestrial gamma-ray flash source lightning, Geophys. Res. Lett., 37, L02,801, doi: rm10.1029/2009GL041753. Cummer, S. A., Y. Zhai, W. Hu, D. M. Smith, L. I. Lopez, and M. A. Stanley (2005), Measurements and implications of the relationship between lightning and terrestrial gamma ray flashes, Geophys. Res. Lett., 32, L08,811, doi: rm10.1029/2005GL022778. Dwyer, J. R., and D. M. Smith (2005), A comparison between Monte Carlo simulations of runaway breakdown and terrestrial gamma-ray flash observations, Geophys. Res. Lett., 32, L22,804, doi: rm10.1029/2005GL023848. Fishman, G. J., et al. (1994), Discovery of intense gamma-ray flashes of atmospheric origin, Science, 264(5163), 1313-1316. Inan, U. S. (2005), Gamma rays made on earth, Science, 307(5712), 1054-1055, doi: rm10.1126/science.1109392. Inan, U. S., and N. G. Lehtinen (2005), Production of terrestrial gamma-ray flashes by an electromagnetic pulse from a lightning return stroke, Geophys. Res. Lett., 32, L19,818, doi: rm10.1029/2005GL023702. Inan, U. S., S. C. Reising, G. J. Fishman, and J. M. Horack (1996), On the association of terrestrial gamma-ray bursts with lightning and implication for sprites, Geophys. Res. Lett., 23(9), 1017-1020, doi: rm10.1029/96GL00746. Inan, U. S., M. B. Cohen, R. Said, D. M. Smith, and L. I. Lopez (2006), Terrestrial Gamma-ray Flashes and Lightning Discharges, Geophys. Res. Lett., 33, L18,802, doi: rmdoi:10.1029/2006GL027085. Lehtinen, N. G., M. Walt, U. S. Inan, T. F. Bell, and V. P. Pasko (1996), -ray emission produced by a relativistic beam of runaway electrons accelerated by quasi-electrostatic thundercloud fields, Geophys. Res. Lett., 23(19), 2645-2648, doi: rm10.1029/96GL02573. Stanley, M. A., X.-M. Shao, D. M. Smith, L. I. Lopez, M. B. Pongratz, J. D. Harlin, M. Stock, and A. Regan (2006), A link between terrestrial gamma-ray flashes and intracloud lightning discharges, Geophys. Res. Lett., 33, L06,803. Chen et al., “VLF strip holographic imaging of lightning associated ionospheric disturbances,” Radio Science, vol. 31,Number 2,p.335,1996. 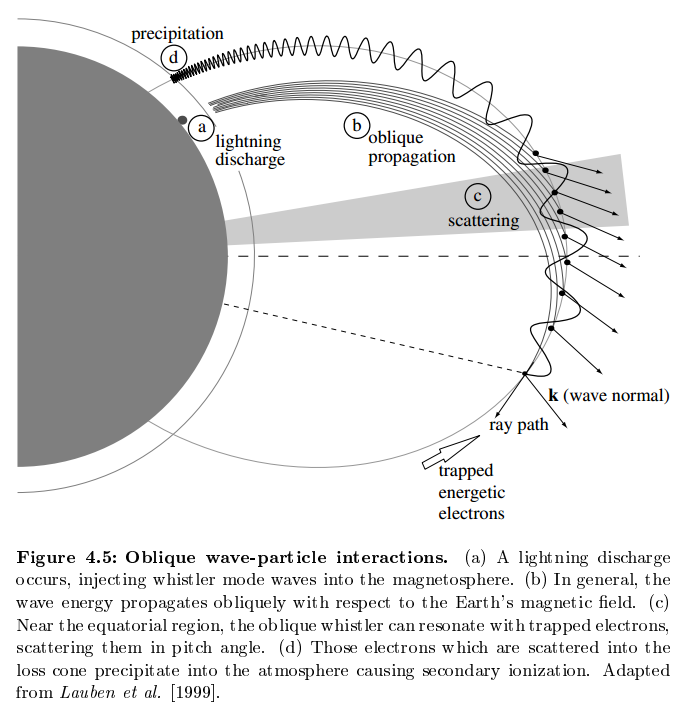 Inan et al., “Subionospheric VLF “Imaging” of Lightning Induced Electron Precipitation From the Magnetosphere,” JGR,vol.95,p.17217,1990. Inan et al., “Sustained heating of the ionosphere above thunderstorms as evidenced in ‘early/fast’ VLF events,”. GRL, vol. 23,p.1067,1996. Lev-Tov et al., “Altitude profiles of localized D region density disturbances produced in lightning induced electron precipitation events,” JGR, vol 100, p.21375,1995. Inan et al., “Lightning Associated Precipitation of MeV Electrons from the inner radiation belt,”. GRL, vol 15,p.172,1988. 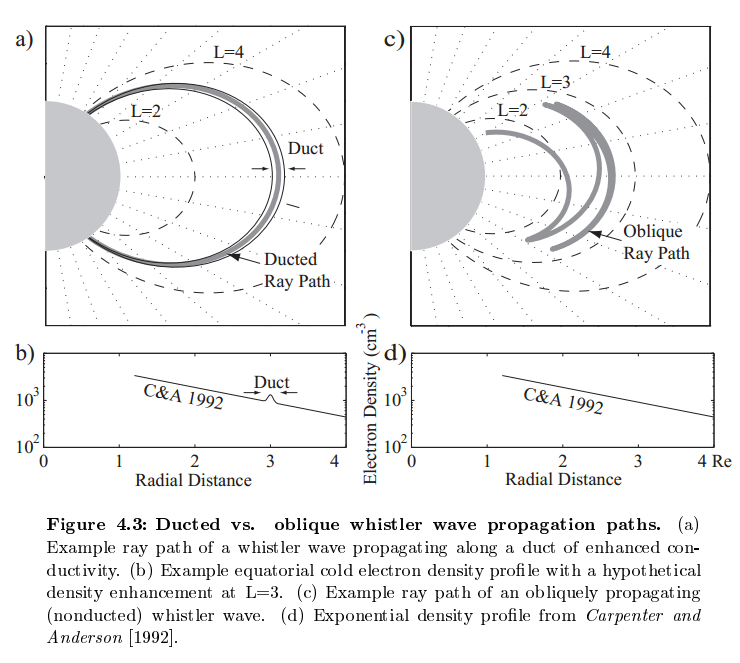 Poulsen et al., “A Multiple Mode Three-Dimensional Model of VLF Propagation in the earthIonosphere Waveguide in the Presence of Localised D Region Disturbances,” JGR, vol.98, p.1705,1993. 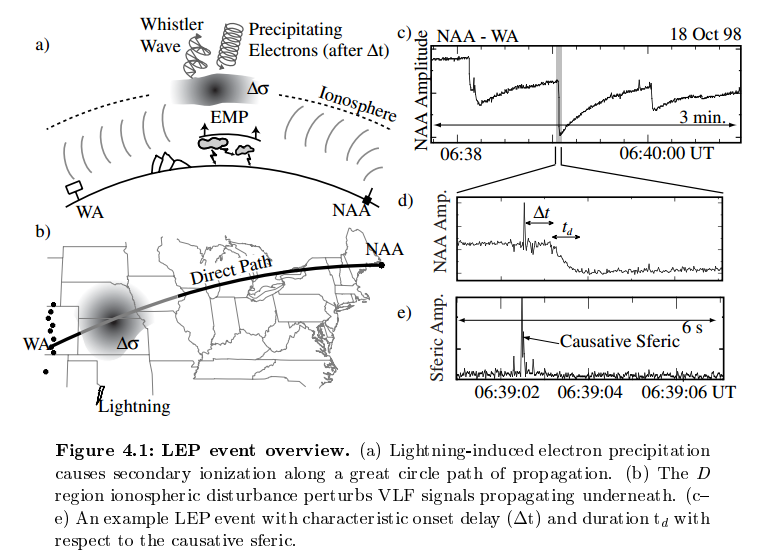 Yip et al., “On the spatial relationship between lightning discharges and propagation paths of perturned subionospheric VLF/LF signals,” JGR,vol.96,p.249,1991. 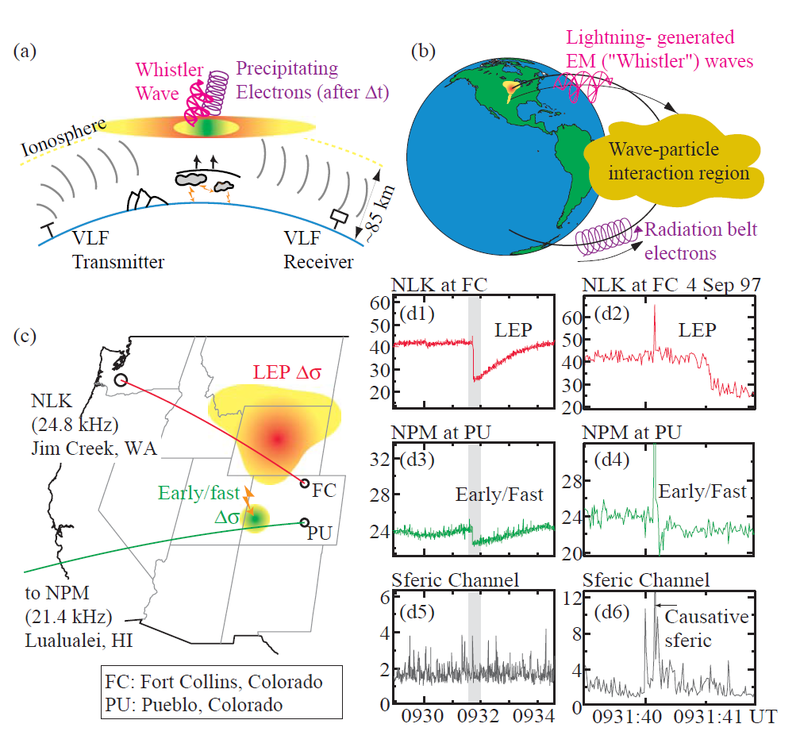 Inan et al., “Subionospheric VLF/LF Phase Perturbations Produced by Lightning-Whistler Induced Particle Precipitation,” JGR,vol. 90, p.7457,1985. Inan et al., “VLF and LF signatures of mesospheric/lower ionosperic response to lightning discharges,” JGR,vol. 101, p. 5219, 1996. Inan et al., “VLF signatures of ionospheric disturbances associated with sprites,” GRL, vol. 22, p.3461,1995. Wolf and Inan, “Path-Dependant Properties of Subionospheric VLF Amplitude and Phase Perturbations Associated with Lightning,”. JGR,vol.95,p.20997,1990. Barrington-Leigh and Inan, “Spatial Extent and Spectral Characteristics of Elves Triggered by Positive and Negative Lightning Discharges,” in review at GRL.